The Catholic Church in South Korea (called Cheonjugyo, Hangul: 천주교; Hanja: 天主教; literally, "Religion of the Lord of Heaven") is part of the worldwide Catholic Church, under the spiritual leadership of the Pope in Rome. At the end of 2017, it had 5,813,770 members (11.0% of the population) with 5,360 priests and 1,734 parishes. Spanish Jesuit priest Gregorio Céspedes was possibly the first Catholic missionary in Korea, arriving in Busan on 27 December 1593 (Yet, this is just about the possibility, or rather, the probability. There's no evidence that de Cespedes came to the Korean peninsula and gave the baptisms to dying children, as a Spanish Jesuit historian asserted in his book cited here). At the time of the Japanese invasions of Korea (1592–98) Japanese leader Konishi Yukinaga married a Korean Christian woman, who had adopted Julia as her name. Macau received an influx of African slaves, Japanese slaves as well as Christian Korean slaves who were bought by the Portuguese from the Japanese after they were taken prisoner during the Japanese invasions of Korea (1592–98) in the era of Hideyoshi. However, Catholicism (and Christianity in general) in Korea more generally began in 1784 when Yi Seung-hun was baptized while in China under the Christian name of Peter. He later returned to Korea carrying religious texts, and baptized many fellow countrymen. The Church in Korea continued without formal missionary priests until clergy from France (the Paris Foreign Missions Society) arrived in 1836 for the ministry. During the 19th century, the Catholic Church was targeted by the government of the Joseon Dynasty chiefly for the religion's opposition to ancestral "worship", which the Church perceived to be a form of idolatry, but which the State prescribed as a cornerstone of Korean culture. Despite a century-long persecution that produced thousands of martyrs — 103 of whom were canonized by Pope John Paul II in May 1984, including the first Korean priest, St. Andrew Taegon Kim, who was ordained in 1845 and martyred in 1846 — the Church in Korea expanded. 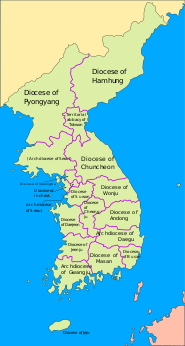 The Apostolic Vicariate of Korea was formed in 1831, and after the expansion of the Church structure over the next century, the current structure of the three Metropolitan Provinces, each with an Archdiocese and several suffragan Dioceses, was established in 1962. In 1899, "the Sinch'uk Rebellion, a Confucian-led and -organised popular uprising", made a "most barbarous massacre" of from 500 to 600 victims. It was in reaction to promises of tax exemptions by lay-assistants and desecration of "spirit-shrines" by Catholics, after the arrival of two French priests to Cheju. Government surveys showed that more than 45% of South Koreans practice no religion, that about 22% are Buddhists, and that 28% are Christians with 11% being Catholics and 18% being Protestants, meaning that Christianity is the largest religion. The Catholic Church in South Korea has seen significant growth in recent years, increasing its membership by from 7.9% of the population to 11% over the past twenty years. At the end of 2017 there were 5,813,770 Catholics in South Korea — 11.0% of the population. In 2017, the Church grew by 1.3%, with over 75,000 adult baptisms. Part of this growth can be attributed to the Church's relatively positive perception by the general public because of its role in the democratization of South Korea, its active participation in various works of social welfare, and its respectful approach to interfaith relationship and matters of traditional Korean spirituality. There are 15 dioceses including three archdioceses – Seoul, Daegu, and Gwangju – and a military ordinariate. In North Korea under the communist regime, Christianity is officially suppressed, and unofficial estimates by South Korean Church officials place the number of Catholics there at only 5,000. The North Korean Catholic Church, ecclesiastically united with South Korea, is composed of the two dioceses of Diocese of Pyongyang and Diocese of Hamhung (suffragan to the Metropolitan Archbishop of Seoul), and the only territorial abbey outside Europe, the Territorial Abbey of Tokwon or Dokwon. South Korea (and by extension the Catholic Church in all Korea, north and south) has the fourth largest number of saints in the Catholic Church since 1984 as categorized by nation, a number which includes the Korean Martyrs. Pope Francis accepted an invitation to visit South Korea in August 2014. The four-day visit (14–18 August) culminated with a Papal Mass at Myeongdong Cathedral, the seat of the Archdiocese of Seoul on 18 August. During a mass on 16 August, the Pope beatified 124 Korean Catholic martyrs. An invitation for North Korea's Catholics to attend was declined, due to South Korea's refusal to withdraw from military exercises which it had planned with the United States. Catholicism in South Korea is unique in that it has inculturated with traditional Confucian customs that form an integral part of traditional Korean culture. As a result, South Korean Catholics continue to practice ancestral rites and observe many Confucian customs and philosophies. ^ a b c d "Catholic Church in Korea Statistics 2017". Retrieved 12 April 2018. ^ Donald F. Lach (15 July 2008). Asia in the Making of Europe, Volume I: The Century of Discovery. University of Chicago Press. p. 721. ISBN 978-0-226-46708-5. ^ Chai-Shin Yu (1 January 1996). The Founding of Catholic Tradition in Korea. Jain Publishing Company. p. 141. ISBN 978-0-89581-892-8. ^ Daniel Tudor (2012). "4 Christianity". Korea: The Impossible Country. Tuttle Publishing. ISBN 146291022X. Retrieved 2 February 2014. ^ Kaijian Tang (2015). Setting Off from Macau: Essays on Jesuit History during the Ming and Qing Dynasties. BRILL. p. 93. ISBN 9004305521. Retrieved 2 February 2014. ^ David J. Nemeth (1987). The Architecture of Ideology: Neo-Confucian Imprinting on Cheju Island, Korea. University of California Press. pp. 145–. ISBN 978-0-520-09713-1. ^ "Statistics of the Catholic Church in Korea, 1997". CBCK. Catholic Bishops' Conference of Korea. Retrieved 13 April 2018. ^ Rupert Wingfield-Hayes (16 August 2014). "Pope Francis beatifies 124 South Korean Catholic martyrs". BBC. ^ Park, Chang-Won (10 June 2010). Cultural Blending in Korean Death Rites. Continuum International Publishing Group. pp. 12–13. ISBN 978-1-4411-1749-6. This page was last edited on 21 April 2019, at 21:50 (UTC).